Guide and information of Japan travel, with embassy, national holidays, immigration bureau, money exchange, post office. It is one of the Shita-machi towns in Tokyo, where you can let yourself be enchanted by the air of temple incense. As a contrast to the neon lights of Tokyo's many nightlife attractions, in a Shita-machi you can experience the atmosphere of Edo - the old Tokyo. Tokyo has Asakusa, Ueno, Yanaka, Sendagi and Nezu to relax. It is worth visiting Asakusa Culture and Tourism Center in front of Kaminarimon Gate (the left picture with red color lantern). The Japanese modern style building has not only all-about information but also nice cafe and terrace where you can get the great view of Tokyo Skytree over Sumida river (no admission ticket required). Feel not good while in Tokyo? This is the whole list of foreign language doctor/hospital and medical institutions => for your safe travels in Japan . Asakusa was founded as fish village. About 1500 years ago (in 7th century? ), one fisherman scooped Kannon sama (Goddess Kannon) from Sumida River while netting fish from the river. Dedicated her to the temple which was the origin of Sensouji Temple. Tokugawa Shogun visited and devoted. After Meiji Restration, town becomes one of the shopping and entertaiment district in downtown Tokyo, lasted as such before Ginza took place. After the war, Asakusa returns back into cultural center of Japanese tradition as seen in Edo era. One of the interesting places to live in Tokyo. Asakusa is located on the north-east of central Tokyo, easy access to many popular sightseeing spots like Ueno (3 min. ), Akihabara (5 min. ), Tokyo main station (15 min), Ginza (16 min. ), Roppongi (20 min. ), Shinjuku (25 min. ), Harajuku (25 min. ), Shibuya (26 min. ), and you can also take ferry from Sumida River Park to the Tokyo Bay area, for instance, to visit Odaiba. Nikko can be reached by Tobu Line (direct train). There are also direct connections to both Narita Airport (Terminal 1 and Terminal 2) and Haneda Airport (International Terminal and Domestic Terminal). 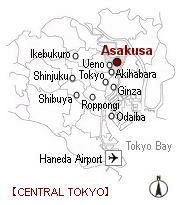 For night owls, Asakusa is not an ideal place to stay since there is no 24-hour-public-transportation in downtown Tokyo. Better to stay Roppongi and Shibuya walking distance or short taxi ride distance. Tap water is safe to drink anywhere inside Japan. Although, you may not like a slice bit of taste of swimming pool, you know the white tablet called Chlorine. Even Tokyo Water is getting better each year (you may be interested in reading www.waterprofessionals.metro.tokyo.jp for the improvement), you may dislike the processed water in small island, but please do not worry, there are major water brand such as evian and volvic and vittel sold any super market, and you must try Suntory brand or Mt.Fuji brand water while here in Japan. No inoculations nor vaccinations are needed to enter Japan from anywhere around the world. Younger doctors are well educated in English these days, medical systems and facilities in Japan are well established so that you can expect to receive a high standard medical treatment if you were not scared of IT style ER. Amburance needed? Please call 119, no need coin nor telephone card for any public phone in such emergency. And here's your English speaking doctor. Japan's fiscal year starts April 1st, not January 1st, no kidding. Spring blooms flowers, grasses are getting greener, new office, new boss, new classmate are excited to the day for new era (if not scared to be teased on April Fool). Except Hokkaido, whole Japan experiences rainy season in most of whole June and July. Summer is hot and sticky, but Asahi beer is cold, Sapporo beer is tasty, Kirin is spectacular. Summer events represent fireworks throughout the islands, which can be enjoyed from river banks and waterfronts usually. Asakusa has rare in-city-activities along with Sumida river. Tokyo Ryokan is in the right spot. Colorful autumn is expected in October, November and December. Next to the rainy season (June and July), actually, autumn front line pours a lot of rain as well. Winter is the season for ski, snowboard and onsen! You might remember the Olympics, both Sapporo and Nagano. December through February or March is indeed fun season in Japan. All of Japan has a single time zone, nine hours ahead of GMT or UTC. There is no system of Daylight Saving Time (Summer Time) in Japan, so you don't need to change your watch/clock by season. Hokkaido in summer gets sunrise at 3:30 am, early birds get three yen (JPY3), Hokkaido in winter sunsets at 3:30pm, long hour night owl activities! Interested in Lunar/Solar calender in Japan? Please click here to be "lunatic". Easy to handle your body clock, but watch out for the jet-lag! Wherever you come into Japan from GMT+1 or GMT-7, try stay awake until it gets dark, then finally sleep well like log or child, so next morning (JST = GMT+9) will be super fine without jet-lag. 100 volts AC. 50Hz in Tokyo and eastern Japan, 100 volts AC. 60Hz in Osaka and western Japan. Sockets or power points have a two-pin plug with rectangular shape. What does it look like? This page has a picture with detailed information. North Americans, please don't you worry, Japan is as same as yours, almost! Please bear in mind that there is not usually a third pin (the earth) here in Japan. Department stores, shopping stores, restaurants are open on Saturdays, Sundays and National Holidays in Japan. Banks and Post offices are closed on Saturdays, Sundays and National Holidays, but some main post offices (including the one in Asakusa and in Tawaramachi) are open seven days a week. Banks open 09:00-15:00, and Post pffices open 09:00-17:00. Offices are closed on Saturdays, Sundays and National Holidays. Most museums are closed on Mondays. As robot is taking place of human beings' simple (and usually boring) job, some people can reach earlier retirement than average (say, 50's or even early 40's if you planned and worked very hard), some other people even work less than 20 hours a week, in another words, some does only work 2 days a week, and rest 5 days a week. Welcome to the "future" world! Foreign credit card and cash cards can be used at Post Office (there are over 26,000 post office ATMs in Japan) and Seven Bank ATMs (Over 14,700 Seven Bank ATMs are placed at 7-Eleven convenience stores in Japan) throughout Japan. Accepted credit cards include VISA, Master Card and American Express. If you bought too much presents and souvenirs in Japan, don't pay airlines for excess luggage fee, but post them to your sweet home at any post office found in Japan (including airport post offices). It is as easy as 1-2-3 as shown at this page. No Japan Post Service around you? Alternate service by cute Black Cat will be right beside you (pick-up service as well as walk-in service) at this page. If you had ski gear or snowboard gear, Ski Ta-Q-Bin and Airport Ta-Q-Bin are recommended. Let's travel with free hands! Officially need help from your own country while here in Japan? Please find your own embassy and consulate at this MOFA (Ministry of Foreign Affairs of Japan). Working permission is required for those who wants to have job in Japan. Please contact your local Japan Embassy in your country at this page. Good news for those less than 30 years old. Working-Holiday Programme is still available for those come from Australia, Canada, Denmark, France, Gremany, Hong Kong, Ireland, Korea, New Zealand, Taiwan and the UK. Public telephones accept 10 yen and 100 yen coins and/or telephone cards. A local call (within Tokyo's central 23 Wards and some other metropolitan cities) costs 10 yen per minute. If you put in two 10-yen coins and speak for less than one minute, one of the coins will be returned to you. No change is given for partial use of a 100 yen coin. Prepaid telephone cards cost 1,000 yen from vending machines, kiosks at train stations, and convenience stores. Charges for inter-city calls vary according to the distance. There is mobile phone and pocket wifi rental service for foreign tourists in Japan. For further information please contact any of the following companies.